NRC/GT Query: Are Programs and Services for Gifted and Talented Students Responsive to Beliefs? If individuals differ in these ways or others, then how do we view the talents and gifts of students in our schools and classrooms? Is it a matter of defining terms, reflecting on beliefs about abilities, or providing professional development opportunities? Gifted and talented means individuals have the capacity to learn that is measurably different from their same-age peers. Intelligence is a psychological construct used to describe abilities that require reasoning, wisdom, and insight. Talent development is a process of recognizing, nurturing, and supporting the skills and abilities of people who have not already demonstrated complete mastery. Creative productivity is the confluence of intellectual and affective human traits directed by an individual’s interests and willingness to develop a written, visual, or auditory product or performance that did not already exist in the same exact form in a specific field of study. Learning ability is a demonstrated propensity to acquire new knowledge or skills. These suggested definitions are most likely as adequate as those proposed by researchers and theorists in psychology, human development, sociology, and education. They reflect personal and professional perspectives. Would everyone agree with each definition? Probably not. A wordsmith or two would work together until there was a general consensus on the interpretation and importance of each word and determine its implications within and across all cultural groups and at all levels of economic status. Gifted and talented children are those identified by professionally qualified persons who by virtue of outstanding abilities are capable of high performance. These are children who require differentiated educational programs and services beyond those normally provided by the regular school program in order to realize their contributions to self and society. It can be assumed that utilization of these criteria for identification of the gifted and talented will encompass a minimum of 3 to 5 percent of the school population. Evidence of gifted and talented abilities may be determined by a multiplicity of ways. These procedures should include objective measures and professional evaluation measures which are essential components of identification. A differentiated curriculum which denotes higher cognitive concepts and processes. Instructional strategies which accommodate the learning styles of the gifted and talented and curriculum content. Children and youth with outstanding talent perform or show the potential for performing at remarkably high levels of accomplishment when compared with others of their age, experience, or environment. These children and youth exhibit high performance capability in intellectual, creative, and/or artistic areas, possess an unusual leadership capacity, or excel in specific academic fields. They require services or activities not ordinarily provided by the schools. How do you define the characteristics of gifted and talented students? If you live in a state that mandates identification and programming, does the definition reflect your beliefs about students’ abilities? What services and activities would challenge the talents and abilities of students? Do you know how to identify and nurture manifest, emergent, or latent talents? Do you have experience with students who perform at remarkably high levels? What is your understanding of high-level accomplishments? Would talents be recognized in all areas of human endeavor? What are your professional development needs to successfully identify gifted and talented students and provide challenging programming opportunities? At first, these questions may seem easy to answer if you are completing the exercise by yourself. They require reflection on your personal and professional beliefs and in-depth understanding on the varying needs of talented students. To determine whether your responses are similar to others, organize a small group of people and ask them to share individual and group perspectives. Questions such as those listed above would be great discussion starters for professional development opportunities. Fullan’s lessons offer a reality check for many of us who reflect on the needs of teachers and students alike and think about how we can make the learning better. We may not have immediate answers, but there are ways to think about the types of services that would be most appropriate. School districts should create a continuum of local services as an exercise to determine the extent to which multiple opportunities are responsive to students’ talents and abilities. Are services available to all, some, or just one student? Should services be unique to some children or just one child? What is appropriate for your school and classroom? Even, more importantly, what is your district’s philosophy about meeting the needs of students? Oftentimes, a district’s philosophy will state, “we want students to reach their potential.” Does that sound familiar or is the phrase more of a paper promise to the students and the community? 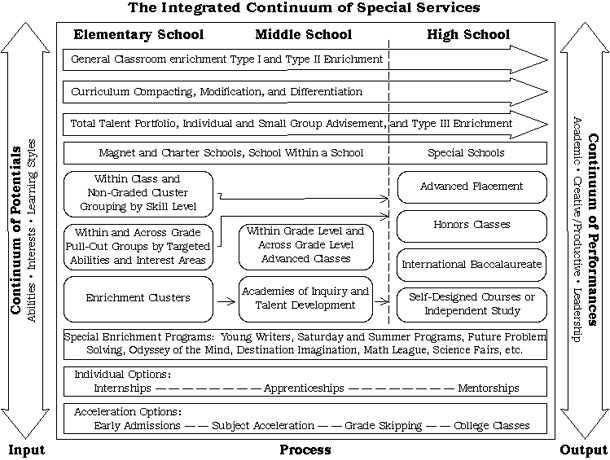 One example of an integrated continuum of services (see Figure 1) focuses on the specifics of programming for elementary, middle, and high school students. Note the orientation of the continuum: input, process, and output are spaced horizontally. Vertical sidebars, which are more recent additions to the 1985 diagram, emphasize the continuum of potentials (i.e., abilities, interests, and learning styles) and the continuum of performances (i.e., academic, creative productive, and leadership). As a second exercise, change the continuum into a short questionnaire by grade level clusters (i.e., elementary, middle, and high school). Ask administrators and teachers to circle existing services. Share the information and then ask them to discuss the possibility of considering additional services. How many of these special services apply to your elementary school (ES), middle school (MS), and high school (HS)? Circle the appropriate school levels. What services do your students need? To what extent are existing services connected to students’ skills, abilities, talents, and interests? Does your school district prefer one or more services for some or all grade levels? What services should be added, modified, or reconsidered? Approach these questions or others by asking if the services are appropriate for all students, some students, or one student. Remember professional development should also be designed in response to educators’ needs and the requirements of specific services. Knowing, understanding, and nurturing the gifts and talents of your students are steps to enhancing educational opportunities for the entire school district. Archambault, F. X., Jr., Westberg, K. L., Brown, S., Hallmark, B. W., Zhang, W., & Emmons, C. (1993). Regular classroom practices with gifted students: Results of a national survey of classroom teachers (Research Monograph 93102). Storrs: University of Connecticut, The National Research Center on the Gifted and Talented. Fullan, M. (1993). Change forces: Probing the depths of educational reform. New York, NY: Falmer Press. Marland, S. P., Jr. (1972). Education of the gifted and talented, Volume I: Report to the Congress of the United States by the Commissioner of Education. Washington, DC: United States Government Printing Office. NRC/GT Researchers. (1997). Extending the pedagogy of gifted education to all students: Professional development modules. Storrs: University of Connecticut, The National Research Center on the Gifted and Talented. Renzulli, J. S., & Reis, S. M. (1985). The Schoolwide Enrichment Model: A how-to guide for educational excellence. Mansfield Center, CT: Creative Learning Press. United States Congress, Educational Amendment of 1978 [P.L. 95-561, IX (A)]. United States Congress, Javits Gifted and Talented Students Education Act of 1988 (P.L. 100-297, Sec. 4130). United States Department of Education. (1973). National excellence: A case for developing America’s talent. Washington, DC: Office of Educational Research and Improvement.